Mian, a physicist originally from Pakistan, focused his remarks on a resolution, AR 230, currently in the New Jersey Assembly, urging the federal government to ratify the Treaty on the Prohibition of Nuclear Weapons and to pursue other measures to reduce the danger of nuclear war. The resolution passed a committee hearing on March 11 and will be going to a full vote of the Assembly. Mian pointed out that N.J. could be the second state after California to pass such a resolution. “People need to talk to their elected officials,” he added, noting that Massachusetts is currently working on a similar proposal and a number of municipalities have passed resolutions urging the U.S. government to adopt anti-nuclear weapons policies. Mian is currently working on an op-ed article advocating a policy of no first-use of nuclear weapons. “The catastrophic scale of death and destruction could destroy modern civilization and condemn millions to destruction and death,” he said. Seventy countries have signed the 2017 agreement to prohibit nuclear weapons, but the U.S. has remained opposed. Goldston zeroed in on his new idea, which he recently presented in an article in the Bulletin of Atomic Scientists. A nuclear declaratory policy, he claimed, can significantly reduce the likelihood of the use of nuclear weapons. “Any use of nuclear weapons could quickly lead to planetary catastrophe,” he said. To mitigate the risk of nuclear war, Goldston stated, the nine countries with nuclear weapons should state what they will and won’t do in the face of threats to their security or the security of an ally. In promoting the idea of a nuclear declaratory policy, Goldston said, “The goal should be elimination of all nuclear weapons. That’s the direction we want to move in.” Currently the U.S. is committed to the option of using nuclear weapons to protect vital interests of the U.S. or its allies, but Goldston called for the policy to move towards allowing nuclear weapons only as a defensive last resort, then adding a commitment to no first use. 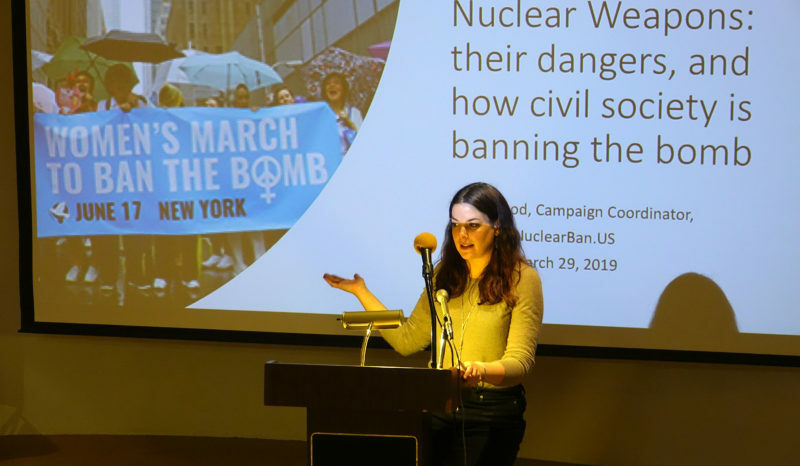 Wood, whose organization was formed in the wake of the United Nations 2017 Nuclear Ban Treaty, is working to educate and mobilize people in support of that treaty. She outlined a number of initiatives designed to progress towards abolition of nuclear arms. “We need to include the younger group and we need to mobilize and bring back a grassroots movement in support of this treaty,” she said. Emphasizing the number of nuclear weapons “on hair-trigger alert,” ready to be launched in minutes, and the high potential for errors in judgement or technology, Wood criticized “the imperialistic and patriarchal undertones undermining diplomacy and international laws.” She went on to advocate diplomacy and reliance on international law and treaties, as she dismissed the idea of deterrence as a positive value of nuclear weapons. “The notion of deterrence is something we have to get past,” she said. “It’s too dangerous. There are many other ways to look at gaining security and peace without threatening violence.” She decried the “self-perpetuating system” of the nuclear weapons industry with corporations spending millions of dollars on lobbying efforts to win government support. She went on to call for communities, states, and universities to stop investing in companies that do business with the nuclear weapons industry.